Costa Motorcycle Co as of late uncovered their first since forever item, Numero Uno (Number One in Italian). 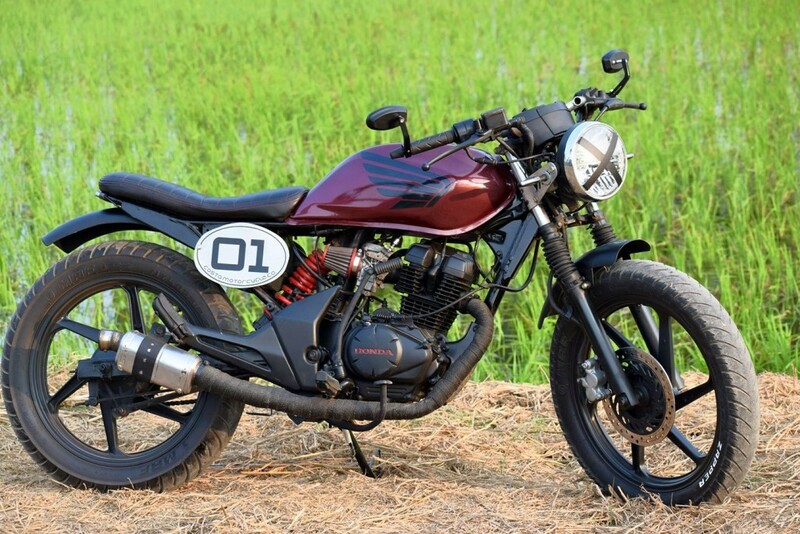 They are from West Godavari, Andhra Pradesh and made this Cafe Racer out of Honda CB Unicorn 150. The idea that followed really taking shape of Numero Uno was the utilization of least body parts and that can be obviously observed from the primary look of the cruiser. Moiz Bashiruddin of Costa Motorcycle Co clarifies how they hacked off a portion of the back sub outline and began making a bistro racer out of the intensely decorated worker. Stock parts like seat and curved guards were supplanted with custom units that gave the Brat style look to Numero Uno. The other real change was the utilization of Clubman style handlebar on the cruiser. Honda CB Unicorn's fuel tank was supplanted with a custom unit and it was repainted into this exquisite wine red shade. The front and back wheels are supplanted with 100/90-18 and 110/90-18 separately. The motor was done in Matt Black while they swapped the first air fliter with custom BMC free stream unit. It took a month to finish this entire procedure. Aside from the front lamp, which is round for this situation, the majority of the lights were changed to LEDs on the Numero Uno. The side board now conveys the "01" moniker, symbolizing the same as their first historically speaking constructed. They even settled a custom fumes for added amusing to the cruiser. The combination wheels are similar ones that are offered with stock Honda Unicorn 150.